The Godfrey Hirst Australia story began more than 150 years ago at the company’s original site on the Barwon River with the opening of the Woollen Mill in 1865. More than a century and a half later, Godfrey Hirst is recognised as one of the top 10 carpet manufacturers in the world, with the Geelong site home to the company’s headquarters. Godfrey Hirst also has 33 hectares of production plants with new plants in North Geelong, Breakwater, Melbourne and Laverton, yarn making facilities in Victoria, sales offices nationwide and a worldwide distribution network. Godfrey Hirst relies on state-of-the-art technologies across their carpet making operations, employing the latest yarn making, dying and tufting techniques right through to their state-of-the-art Designer Jet machine capable of producing carpets in any colour or design. The Designer Jet technology puts Godfrey Hirst at the forefront of innovation in product development. 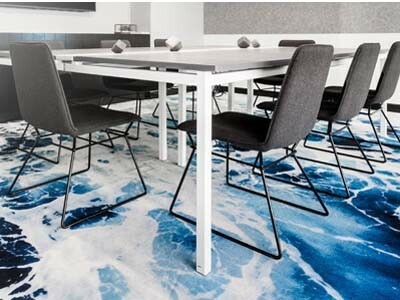 Combined with an ace in-house design team, this advanced technology helps the company rapidly design and produce commercial carpet tiles and two-metre wide rolls for small as well as large projects right here in Australia. Godfrey Hirst is proud to meet the needs of any project with a wide range of high performing products for the commercial market, ranging from broadloom carpets, specialised healthcare carpets and carpet tiles all the way through to timber, luxury vinyl plank and laminate ranges.